In Lifeskills for Adult Children you can learn how to do these things and more. This book is designed specifically for Adult Children and teaches skills to make your complex adult life easier, while improving your sense of self-worth. Examples are provided to help clarify the lessons and exercises are given to help you practice your new skills. 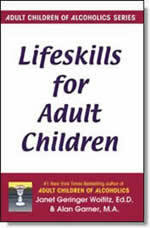 read Lifeskills for Adult Children - you'll be glad you did. I feel like I'm staring at a banquet. All around are people I'd like to meet, but I never seem to make contact. The distance between us, it may be just a few feet, but it feels like a million miles. Everyone else looks so comfortable and seems to have such an easy time making friends. If only I knew lust the right thing to say. Adult children cringe at the idea of having to make small talk. Growing up in a dysfunctional family means that social skills were not adequately developed. Few people really enjoy small talk, but it is a necessary part of the socialization process. If you only have started to connect with others since you've been in recovery, you are learning to relate on the level of personal problems and pain. That is fine for identifying within the program and appropriate for a support group, but, the truth is, there is life beyond the programs. In the larger culture, and even with program people outside of meetings, personal problems and pain are best shared with people as intimacy grows. Getting to that level is a part of a process that begins with small talk and evolves from there. Small talk is the most non-threatening way that people can begin to know each other. People respond as much to tone and energy as to content. Rushing into personal things creates a sense of intimacy before it really exists. And, believe it or not, talking trivia can be fun. Making contact with others will be easier when you know a few simple truths and develop some skills. The first truth is that most people also feel uncomfortable when they are getting conversations going. They only look at ease, just as you probably do to them. Second, most people would like to have more friends in their lives, just as you would. Third, most people are pleased when someone approaches them, as it takes the pressure off them. This chapter will teach you skills that will help you do better in starting conversations, keeping your conversations going, and talking about yourself. There is no need for you, like Terri, to search for "just the right thing to say." The truth is that dull, ordinary openers can work even better than clever openers. The main thing is to say something. When you say something, you've made contact, you've opened up the possibility of establishing a relationship, of making a friend. If others are interested, they will respond, and you can apply the skills in this book to use what they say to get a conversation going. There are basically three subjects you can talk about when you start a conversation: yourself, the other person, and the situation. Talking about the other person or the situation you are both in is far more likely to get the other person involved than only talking about yourself. Why!? Because others are much more interested in themselves and what they're doing than they are in you, especially when they don't even know you. When you look at the following openers, you'll see that those on the right, those that talk about the other person or the situation, are far more likely to get conversations going. The best idea is to make the "I" statement first to show your own willingness to share and so as not to appear intrusive. BEGIN I'm looking forward to this movie. CONTINUE What have you heard about it? BEGIN I'm late for work. CONTINUE Why do you think the bus is late? BEGIN I'm a friend of the host. CONTINUE How did you happen to get invited to this party? There are basically three things you can say when you start a conversation: You can ask a question, voice an opinion, or state a fact. BEGIN There are a lot of people here. CONTINUE Why do you suppose so many people came to this speech? BEGIN This washing machine is hard to work. CONTINUE Can you show me how to work it? BEGIN That book looks interesting. Most people are reactive when it comes to starting conversations. Like Terri, they see people they'd like to meet, people they'd like to make friends with, yet they don't do anything about it. People who succeed socially are typically proactive. They don't sit around waiting for others to come up to them; they speak up, they make things happen. If you want to succeed at friend-making —or at practically anything else —you need to be proactive. EXERCISE: Write down the 10 best things that have ever happened to you. Next, write down whether you or others were responsible for making each of those things happen. Chances are, you will find that most or all of the highlights of your life happened only because you took action and were proactive. Marika: I was stunned when I did this exercise. Here I've been more or less waiting for things to happen in my life, and it turns out that...my going to Europe, my trip to Maui, my meeting my husband, my friendship with Leslie, my job — virtually everything that's been positive and wonderful in my life has happened because of me! Being proactive in starting conversations is often difficult, especially for women who have been taught they "should" be passive. Often these women take this should to an extreme and not only don't say anything to people they'd like to meet, but also don't smile, look at others, or give any other indication of interest. Following this rule deprives them of any realistic likelihood of making contact. But it also provides them with an excuse: They don't have to blame themselves for not getting what they want. They can blame the should. If you have been following this should (or any other should, for that matter), ask yourself: "Who made up this rule?" Chances are you will find that your mother, a teacher, or some other authority figure in your early childhood told you to follow this rule. Tell yourself that it was just their opinion. It was just something they made up — or more likely learned from their parents. It isn't carved in stone anywhere. It isn't any great piece of wisdom. And there's no reason for you to go on obeying it. Tell yourself you're an adult now and you can make up your own mind. Then go ahead and speak up. Many people have difficulty starting conversations because they tell themselves that it would be "awful," "horrible" and "humiliating" if the others weren't interested. When you find yourself thinking thoughts like that, ask yourself: "What, realistically, is the worst thing that might happen if I speak up?" Chances are, the worst thing others might do is excuse themselves or walk away. Tell yourself: "If that happened, it would not be terrible. It would just be unfortunate. I don't want it to happen, but I'd live. In fact, I'd be no worse off. I didn't have that person's attention before and I still wouldn't." In addition, remind yourself that you are better off simply for practicing your new skills, regardless of the response. Each time you practice, you get better and better. Then ask yourself: "What's the best thing that might happen?" Looking at it this way, you'll be surprised how vastly more you have to gain than lose by speaking up. Elise: I wanted to meet this fellow who lived in another building at my complex. Smiling and saying hello didn't work, so I asked myself, "What's the worst that could happen if I start a conversation?" The worst was that he'd say he had to go or that he was busy. Then I asked, "What's the best?" The best was that we'd like each other, get married, and have a lifetime of kisses and cuddles and happy times. Looking at it that way, there was only one smart choice — and I did it! EXERCISE: The next time you find yourself "awfulizing," carry your thoughts to an extreme. For example, if you're thinking about starting a conversation with someone and are worried about being rejected, imagine that person not only rejecting you but also loudly telling everyone in the vicinity that you tried to be friendly. Imagine that person calling up your boss — and getting you fired! Imagine that person calling up your parents or your children — and getting you rejected for the "awful" thing you have done. Carrying your thoughts to an extreme can help you look at your worst fears and see how absurd most of them are most of the time. Homework: Set goals for yourself for starting conversations over the next week. Start wherever you feel comfortable. If you're not used to starting conversations, perhaps a goal of smiling at someone might be right for you. Perhaps your goal will be to start a conversation once a day with people you already know. Here are some sample goals you can choose from, combine, or modify for the next week. Smile at someone once a day for a week. Do not attempt to get a conversation going. Smile at two people a day for a week. Do not attempt to get a conversation going. Smile at three people a day for a week. Do not attempt to get a conversation going. Write out your goal for the week, whatever it is, and post it somewhere you will see it and be reminded of it frequently. Many people post it on their bathroom mirror, on their "To Do" list, or in their datebook. After you have achieved your goal for the day, make a note of it, perhaps with a check mark next to the date. Reward yourself daily when you fulfill your goal, both with your congratulations and with something you would not ordinarily get — perhaps a nice warm bubble bath or a 30-minute walk. Small or large, the only requirement is that your reward be something you want. Your goal is achieved when you do what you set out to do, regardless of whether the other person responds positively. If you don't achieve a goal one day, don't put yourself down. Just get back on track and pick up where you left off the next day. If you are having a hard time remembering to keep your goals, decide to do it each day before you do something else — say, like taking your lunch break. Once you have completed your first week, build on that success each of the following weeks by advancing one more step on the list. You will grow more self-confident and skillful, and your social life will flower as you continue to do this homework. Eventually, you will come to the end of the list, and your goal at that point might be to maintain your level as long as it seems beneficial to you. Each and every day, no matter which goal you are working on, spend five minutes a day vividly picturing yourself in your mind's eye smiling confidently as you complete that goal. Picture those you are speaking with distinctly, what they look like, what they're wearing. Imagine them returning your smile and responding positively. Such covert rehearsals can contribute greatly to success. Basketball, football, hockey players, public speakers -- successful people from all walks of life -- can attest to the tremendous value of imagining success over and over in your mind before you go for the real thing. What you see in your mind can be what you get. (c)1990. All rights reserved. Reprinted from Lifeskills for Adult Children by Janet G. Woititz, Ed.D.. No part of this publication may be reproduced, stored in a retrieval system or transmitted in any form or by any means, without the written permission of the publisher. Publisher: Health Communications, Inc., 3201 SW 15th Street, Deerfield Beach, FL 33442. Janet Woititz was the author of Adult Children of Alcoholics, which was on the New York Times bestseller list for over a year. She wrote several other books, including Lifeskills for Adult Children; The Self-Sabotage Syndrome; The Struggle for Intimacy; Marriage on the Rocks; Healing Your Sexual Self and many others. Woititz was the director and founder of the Institute for Counseling and Training in West Caldwell, New Jersey. Alan Garner, M.A. is a nationally-known relationship-skills trainer who lives in Laguna Hills, California. He is the author if several books including the million-copy selling It's OK To Say No To Drugs, a parent/child manual.